Add water to medium saucepan and sprinkle with gelatin. Allow to soak for a minute or two. Heat over low heat, stirring constantly, until gelatin is dissolved (about 5 minutes). Remove from heat, and stir in Chambord. Pour into pan, and refrigerate until fully set (1 to 2 hours). Prepare lemonade layer. Combine water and concentrate in a medium saucepan, sprinkle with gelatin. 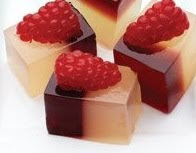 Allow gelatin to soak for a minute or two. Heat over low heat, stirring constantly, until gelatin is dissolved (approximately 5 minutes). Remove from heat. Stir in vodka. Strain to remove any gelatin solids or lemon pulp. Pour over the chilled Chambord layer and refrigerate until fully set (several hours or overnight). To serve, cut into desired shapes. Makes 24 to 30 shots.